Captive environment can have a significant impact on an animal’s behaviour and welfare. 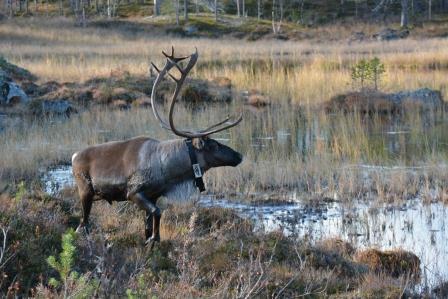 Previous studies have revealed that habitat characteristics can be linked to a variety of behaviours in captive animals. Hence, many zoos now take this into account and have begun to design more complex and naturalist enclosures, with the intention of reducing stress and abnormal behaviour and improving overall well-being. 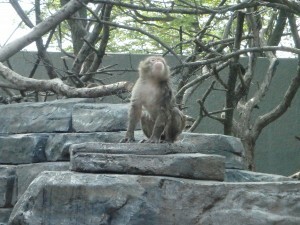 I have been given the opportunity to study the Japanese macaques at the Zoo de Granby throughout their transition from their old enclosure to a new enclosure in order to explore how this change in environment may alter the macaques’ activity budget, social interactions and use of horizontal and vertical space. As visitor attendance varies significantly throughout the open season at the Zoo de Granby, I will also be examining the visitor effect, which has yet to be studied thoroughly in Japanese Macaques. 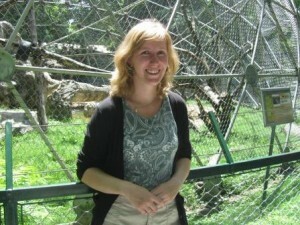 This research will take place at the Zoo de Granby, Granby QC. 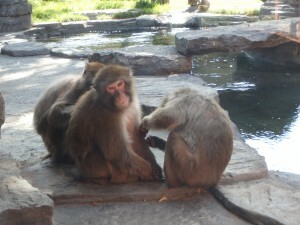 The Zoo de Granby currently houses fourteen Japanese macaques, separated into two non-breeding troops of seven individuals. The macaques had been housed in a decades-old, repurposed enclosure (“Le Géodôme”) up until 2015, when they were transferred to the new enclosure, which measures 665m2 and includes species-appropriated enrichment such as climbing structures and a thermal pool. E.J. Anderson*, Weladji RB., Paré, P. (2015) Activity Budget and Space Use of Zoo-housed Japanese Macaques (Macaca fuscata). 40e congrès annuel pour le Société Québecoise pour l’Étude Biologique du Comportement, 6-8 Novembre, 2015, Quebec City, Quebec, Canada (oral presentation).